A regular breeding species and migrant. The Barn Swallow was an abundant species during the Minnesota Breeding Bird Atlas (MNBBA). Breeding populations of Barn Swallows are found across much of North America, Europe, and Asia. They also extend south into central Mexico and northern Africa. In North America they are found primarily south of the Arctic Circle, from southern Alaska east to the Maritime Provinces and south throughout much of the United States. Breeding densities are highest in the eastern and central United States. Within this area, south-central Minnesota is one of the pockets of highest Barn Swallow density (Figure 1). An open-cup nest made of mud and dried grass. Originally nested in caves and rocky crevices; today nearly all nests are located on man-made structures that provide a vertical wall with an overhanging eave or a flat surface. Nests singly or in colonies. Breeding distribution and relative abundance of the Barn Swallow in North America based on the federal Breeding Bird Survey from 2011 to 2015 (Sauer et al. 2017). Roberts (1932) described this most colorful of Minnesota’s swallows as an abundant summer resident throughout the state. Although he doubted it was present in the western grasslands prior to European settlement, for lack of suitable nesting sites, it had become “the commonest Swallow of the prairie country, finding suitable nesting places about farmhouses and in the environs of towns.” A bird of the farm country, he went on to write, “Its good habits, beautiful plumage, and familiar and confiding ways have made it one of the best known and most loved birds of the rural districts.” Although closely associated with human habitations in western Minnesota, in the early 1900s Barn Swallows could still be found along the North Shore nesting among crevices in the shoreline’s steep escarpments. At the time, nesting was confirmed (nests with eggs or young) in 8 counties (Hennepin, Isanti, Jackson, Kandiyohi, McLeod, Polk, St. Louis, and Traverse). Inferred nesting records were available from 4 counties (Itasca, Rock, Sherburne, and Wabasha). Nesting was also reported from Mille Lacs and Itasca State Park. Decades later, Green and Janssen (1975) simply noted that the Barn Swallow had become most common in the prairie region and “least numerous in heavily wooded areas.” By the time Janssen wrote his updated account in 1987, the species had become common also in the central region of the state. He included a statewide distribution map that delineated a total of 55 counties, widely dispersed across the state, where nesting had been confirmed since 1970. Hertzel and Janssen (1998) later added another 9 counties to the list. The 889 breeding season locations documented by the Minnesota Biological Survey again documented the species’ wide distribution, particularly in agricultural regions of the state (Minnesota Department of Natural Resources 2016). During the MNBBA observers documented 4,863 Barn Swallow records in 55.4% (2,663/4,806) of the surveyed atlas blocks and in 70.9% (1,656/2,337) of the priority blocks. Breeding was confirmed in 1,022 blocks (Figures 2 and 3; Table 1). Records and breeding evidence came from all 87 Minnesota counties. The birds were least abundant in the eastern and northern regions of the Laurentian Mixed Forest Province. The MNBBA predicted breeding distribution map illustrates the species’ predicted abundance throughout Minnesota (Figure 4). Densities are lowest in the Laurentian Mixed Forest Province and are relatively low in the Tallgrass Aspen Parklands Province compared to higher breeding densities found throughout the Prairie Parkland and Eastern Broadleaf Forest Provinces. Densities are predicted to be especially high in small, scattered areas in southwestern and west-central Minnesota. Since Roberts (1932) wrote his original account of the species’ status, there has been little change in the Barn Swallow’s distribution. No doubt it is far more common, however, in the developed areas of the Laurentian Mixed Forest Province than it was 100 years ago, when much of the region remained sparsely settled and developed. The swallow’s adaptation to human landscapes has enabled it to expand its distribution into many areas of the United States where it did not formerly occur. Perhaps most notable is its expansion south through the Atlantic and Gulf states, including the Carolinas, Georgia, Florida, Alabama, Mississippi, and Louisiana, in the latter half of the 20th century (Brown and Brown 1999). Breeding distribution of the Barn Swallow in Minnesota based on the Breeding Bird Atlas (2009 – 2013). Summary statistics of observations by breeding status category for the Barn Swallow in Minnesota based on all blocks (each 5 km x 5 km) surveyed during the Breeding Bird Atlas (2009-2013). Summary statistics for the Barn Swallow observations by breeding status category for all blocks and priority blocks (each 5 km x 5 km) surveyed during the Minnesota Breeding Bird Atlas (2009-2013). Predicted breeding distribution (birds detected per 10-minute point count) of the Barn Swallow in Minnesota based on habitat, landscape context, and climate data gathered during the Minnesota Breeding Bird Atlas (2009-2013) using the General Linear Modeling method without an adjustment for detectability. Although originally confined to caves, rocky ledges, and cut banks, today’s Barn Swallows are almost entirely dependent on man-made structures for breeding (Figure 5). Their conversion is so complete that it is rare to observe the birds nesting in natural settings. While the bird is believed to have been a relatively solitary nester in its natural setting, today it frequently nests in small groups of 2 to 20 pairs and occasionally in much larger colonies (Brown and Brown 1999). Suitable nesting sites need to meet only three requirements: a nearby source of mud for nest construction, open areas for foraging, and buildings for nest placement (Brown and Brown 1999). Habitat within 200 m of MNBBA point counts where Barn Swallows were detected were predominantly croplands and grasslands followed by development and oak forests (Figure 6). Typical breeding habitat of the Barn Swallow in Minnesota (© Lee A. Pfannmuller). Habitat profile for the Barn Swallow based on habitats within 200 m of point counts where the species was present during the Minnesota Breeding Bird Atlas (2009-2013). Long-term monitoring data collected by the federal Breeding Bird Survey (BBS) have been used to generate a North American population estimate of 41 million birds (Rosenberg et al. 2016). In 2013 Minnesota was estimated to support 2.9% of the continental population (Partners in Flight Science Committee 2013). Applying that percentage to the most recent estimate yields a statewide population of approximately 1.2 million breeding adults. Abundant throughout most of its breeding range, especially in the central and eastern United States, the average number of Barn Swallows per BBS route in North America is 15 per year. In Minnesota, which supports particularly high densities in the southern and northwestern regions of the state (Figure 1), an average of 26 birds are observed per route. The highest number is reported in Iowa, where the average is 52 Barn Swallows per route (Sauer et al. 2017). Since the BBS began in the mid-1960s, data collected throughout the United States and Canada demonstrate that Barn Swallow populations have experienced a significant decline, averaging 1.19% per year since 1966 (Sauer et al. 2017) for a cumulative loss of 38% from 1970-2014 (Rosenberg et al. 2016). Most of the decline has been confined to the northern and central regions of the BBS survey region (Figure 7). The long-term rate of decline has been slower in Minnesota, averaging 0.62% per year (Figure 8). An aerial insectivore, the Barn Swallow is one of many members of the foraging guild that is experiencing steady and significant population declines. The declines are particularly acute in the northeastern United States, where the human population density and level of industrial development is high. Nebel and his colleagues have suggested that the resulting increase in atmospheric pollutants and their negative impact on aerial insects may be a strong factor in causing the declines of aerial insectivores (Nebel et al. 2010). Brown and Brown (1999) suggested that strong cold snaps in the northern regions during the spring, when Barn Swallows are just beginning their northward migration, may also regulate populations. Not only are these weather events difficult physically for the birds, but the availability of sufficient food resources is likely limited as well. Population trend map for the Barn Swallow in North America for 1966–2015 based on the federal Breeding Bird Survey (Sauer et al. 2017). 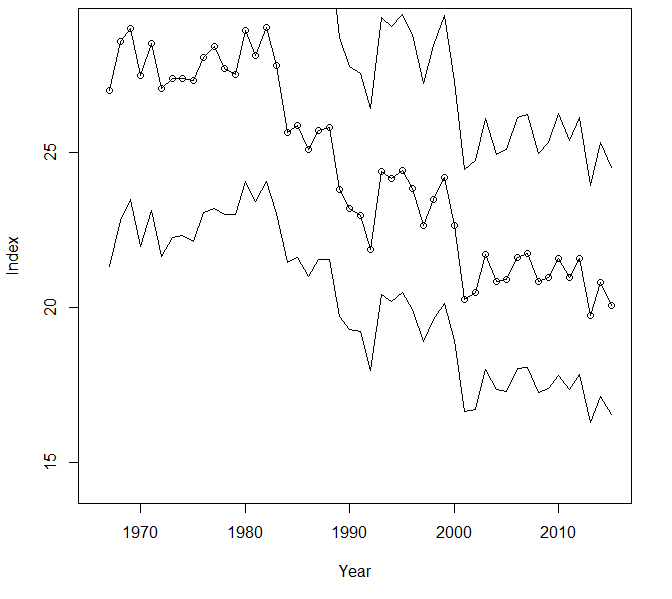 Breeding population trend for the Barn Swallow in Minnesota from 1967-2015 based on the federal Breeding Bird Survey (Sauer et al. 2017). Although populations are steadily declining, the worldwide distribution of the species coupled with its wholesale adaptations to a human-modified landscape are the primary reasons that it is not considered a conservation priority at the federal or state level. Its Continental Concern Score of 8/20 reflects its low priority (Rosenberg et al. 2016). An initial assessment of its vulnerability to climate change ranked it as moderately vulnerable (North American Bird Conservation Initiative 2010). More in-depth assessments are warranted given the species’ long-term decline, the potential impact of declining aerial insect populations, and its long-distance migration to the tropics. Nevertheless, the Barn Swallow’s adaptability has served it well. It remains one of the most abundant members of Minnesota’s avifauna, ranking 19th among the 249 species reported during the MNBBA based on the total number of records. The little Barn Swallow may be a low conservation priority today, but nearly 150 years ago it was at the center of the public’s outrage about the wanton destruction of birds. Stories have been told for nearly a century about how the use of heron and egret feathers in the millinery trade incited outrage and the launch of the National Audubon Society. Barn Swallows, it turns out, also featured prominently in the group’s history. Their destruction solely for the purpose of using their stunning cobalt blue feathers on women’s hats is what prompted George Bird Grinnell to write a famous editorial in his conservation magazine Forests and Streams in 1886. Deploring the carnage, Grinnell asked his readers to sign a pledge to not wear clothing that featured the feathers of any wild bird. This was the first official effort to launch what eventually became the National Audubon Society (Cornell Lab of Ornithology 2016; Chapman 2016).